Minimum length of blades used in the Kageryu is 2 shaku 8 sun (84.8 cm's / 33.5 inches) Five inches longer than the length prescribed by the Shogunate. 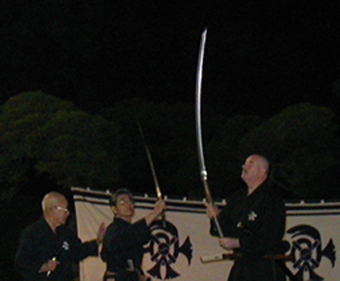 At this time the shortest blade used is well over that length, the longest 4 shaku (121.2 cm's /47.7 inches) The heaviest blade used is mine at just over seven pounds. In should be understood that the use of these weapons is simply a tradition which has been handed down. There is no consideration here as to the longer weapon being superior to a shorter one. The long is for distance and shorter one carried for close work. Shown from the top down: 3 shaku 7 sun (120.1 cm's/44.2 inches. The authors sword 3 shaku 8 sun (45.4 inches) Weight 3.25 kg. The thirds is a sanjaku sword (3 shaku), reportedly the length of the sword used by Sasaki Kojiro It is said his long sword style Ganryu was developed against short sword styles. The length of the longest tsuka from fuchi to kashira is 22 inches. Still less than one third of the total length. Some have a large sori (curve) But there are limitations to this as a big sori also makes a weapon rather unbalanced. Also a Tanto known as a Maezashi in the Kageryu is worn across the front of the body (Shown on other pages). Maezashi are used for throwing or for use in close quarter encounters For example, another person would perhaps grapple with the swordsman to prevent him drawing his longer sword. A comparison of length between Kageryu sword and Josun. Within the techniques Kekaeshi (jumping leg reversal) is frequently used within the forms. 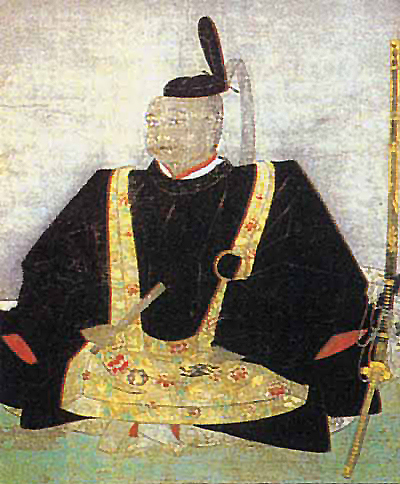 Kage Ryu was used when fighting in Yoroi (armour). It goes without saying, there are no seated forms in Kage-ryu. There are three forms still practised and seven omote. At first one might consider this very few. However within each waza there are many conceivable variations (sotonomono) based on the position, action and timing of an oppponent. Sotonomono is based on the strategy of action and not on the waza. Each waza can be done in tate-hiza (with the toes turned up), standing, drawing the sword with either left or right leg forward. Turning to either side or to the rear in both directions.